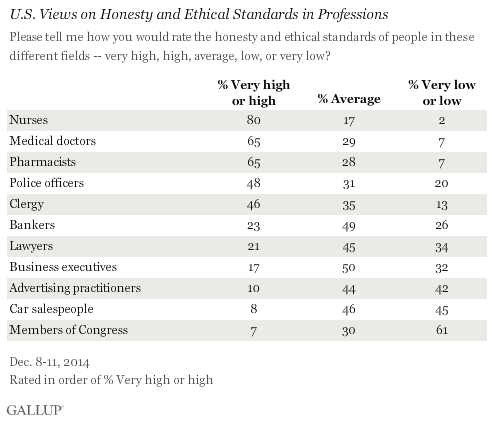 WASHINGTON, D.C. -- In 2014, Americans say nurses have the highest honesty and ethical standards. Members of Congress and car salespeople were given the worst ratings among the 11 professions included in this year's poll. 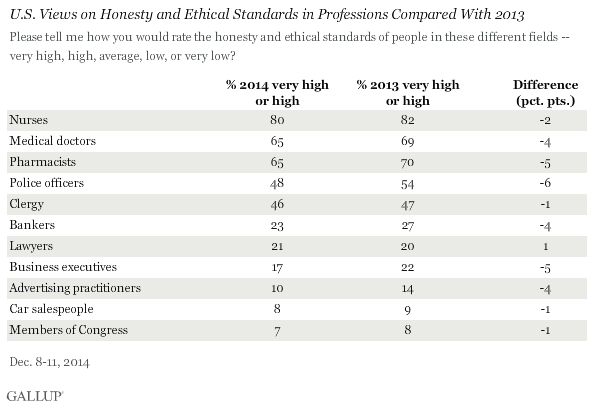 Eighty percent of Americans say nurses have "very high" or "high" standards of honesty and ethics, compared with a 7% rating for members of Congress and 8% for car salespeople. In the wake of racially charged incidents of police violence, Americans' honesty and ethics ratings of police officers have dropped six percentage points from 2013. Nonwhites' ratings have dropped sharply while whites' are unchanged. Ten percent of Americans rate the honesty and ethics of members of Congress as very high or high, above only car salespeople on a list of 22 professions. Medical professionals and engineers receive their best ratings on record.